A Disney Cruise is such a unique vacation and a must do for any Disney fan. The beauty of a cruise is that you can unpack once and see multiple destinations. This vacation allows you to pay one price for your resort, entertainment, and food. Also, Disney Cruise Line offers free soda. This is almost unheard of on a cruise. A Disney Cruise is also a fun way to have Disney (and the characters! ), but at a more relaxed pace. 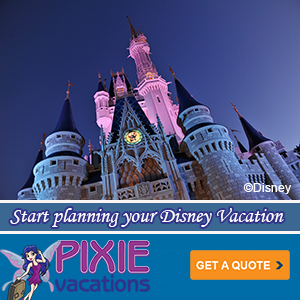 Also, if your family can’t decide between a Disney vacation and a beach vacation then a Disney Cruise gives you both! 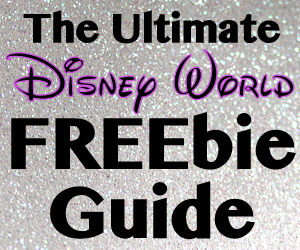 Who Makes Disney World Jewelry Under $40? Alex and Ani! I’ve looked at a lot of Disney jewelry through the years, dating all the way back to the late 1970 when I barely had any money to spend. Now that I am an adult (my family would dispute this description at times) with a job and my own Disney Visa card, I still really love looking at the colorful Mickey-themed jewelry throughout the parks and resorts. And like the Dooney & Bourke purses, expensive watches, and sparkling 14k gold rings, almost all of the jewelry remains on the shelf at the end of my vacation. Adults have monthly car insurance and teen braces bills to pay, after all. So it was a real treat to find these bracelets at Disney World by a company called Alex and Ani, which have that adorable Disney jewelry charm but won’t wreck your budget. Alex and Ani products are “infused with positive energy.” The ancients referred to this precious energy as chi and prana, while modern science simply calls “vital force.” Alex and Ani believe positive energy is the natural energy that supports life. So if Alex and Ani embrace the power of positive energy as their core company belief, how exactly do you infuse each product with positive energy? Their website explains three ways. All their products are manufactured, and infused, with positive intention in carefully selected American factories. The symbols featured on their designs carry their own energy; they are accompanied by thoughtfully crafted and meticulously researched meaning. Each design is positively intended to empower the wearer and reflect the unique qualities of the individual. 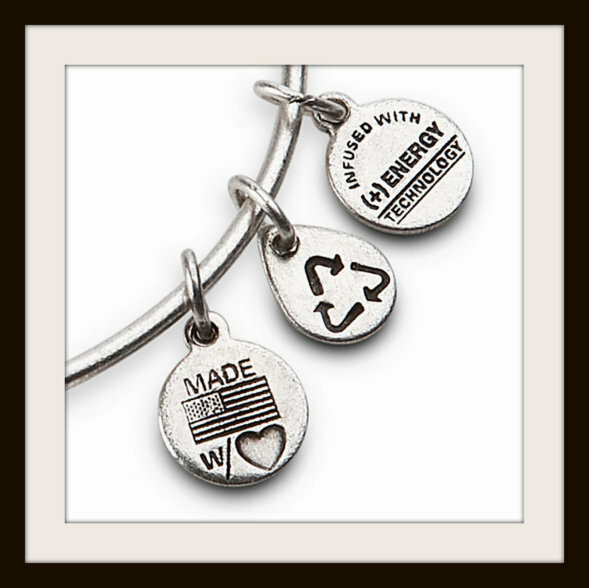 Some Alex and Ani pieces carry sentimental meaning, while others are talismans of protection, power, or intention. Customers can mix symbolic pieces with your own alchemy (isn’t that a fabulously Disney word to associate with jewelry?!) to make Alex and Ani jewelry completely and uniquely yours. 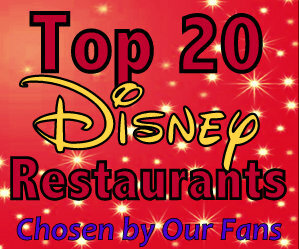 So let’s get to some of their designs, which are found at Walt Disney World and also on the Disney Store.com. 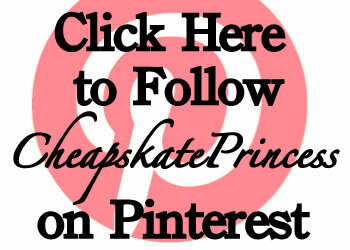 We’ve provided links in case you can’t wait until your next trip to make a purchase. 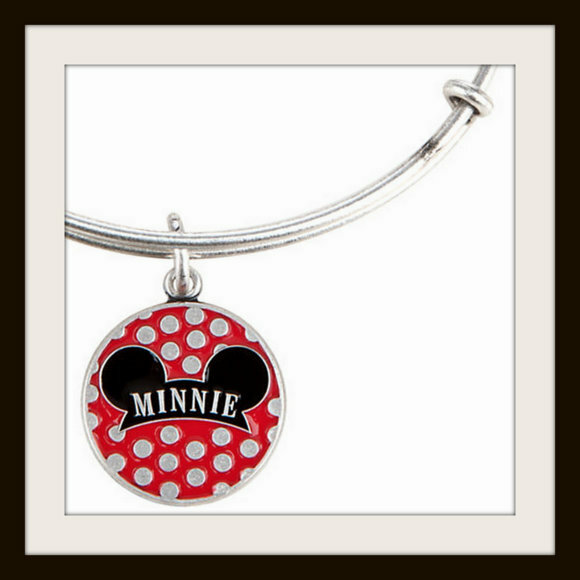 Priced under $40 before shipping, they would make fabulous pre-trip gifts or really gifts for all occasions for the Disney jewelry lovers in your life. 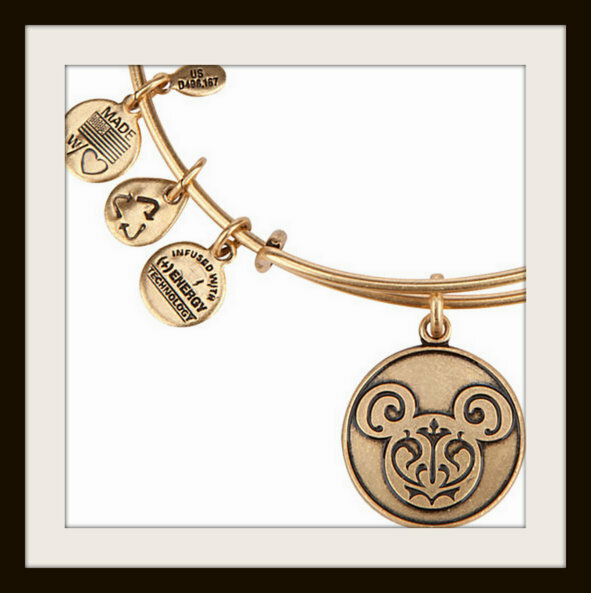 You can embrace the power of positivity with this Mickey Mouse Icon and Initial Bangle Bracelet in Gold. 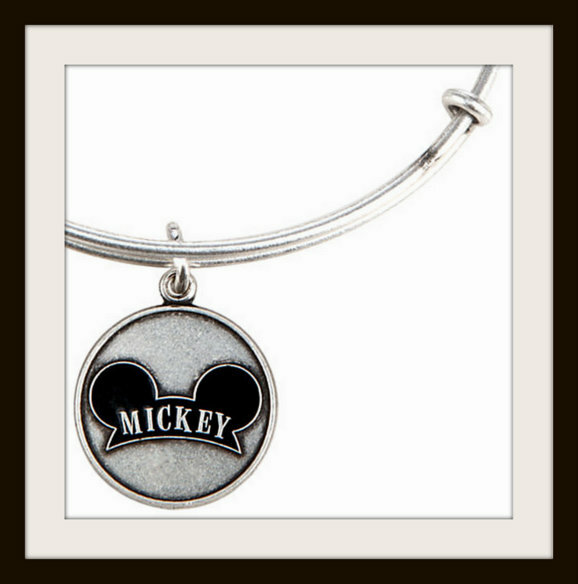 This brass bracelet with Rafaelian Gold finish has Mickey’s icon plus your favorite letter of the alphabet on an antiqued bas relief charm. Click here for the link on the Disneystore.com. The price? Just 31.95 before tax. 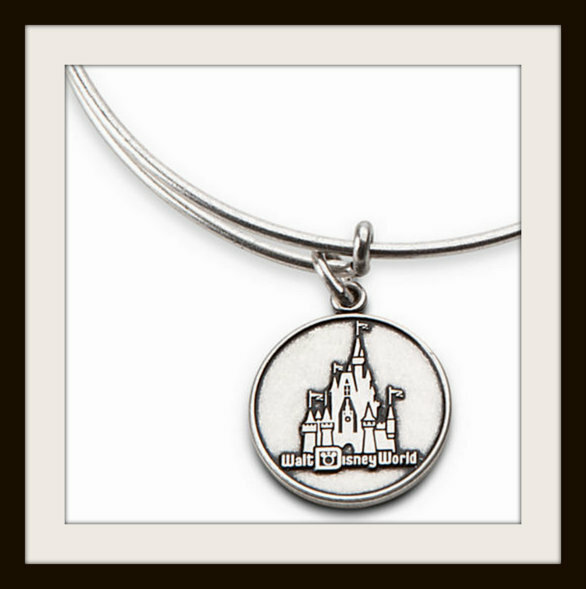 You will embrace the power of positivity with this Cinderella Castle Bangle. 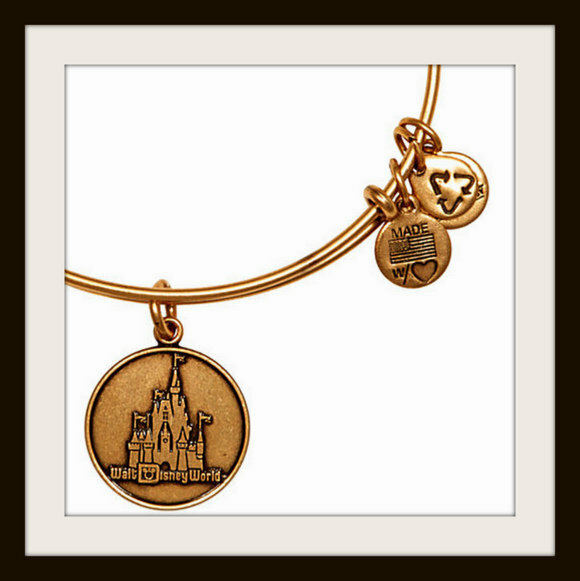 The Walt Disney World dangles from a brass bracelet with Rafaelian Gold finish, producing a stylish souvenir of your visit to the Magic Kingdom. 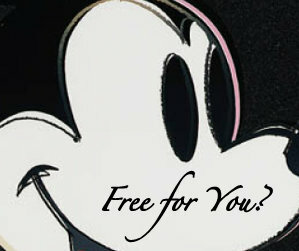 Click here for the link on the Disneystore.com. The price? Just $39.95 before tax. 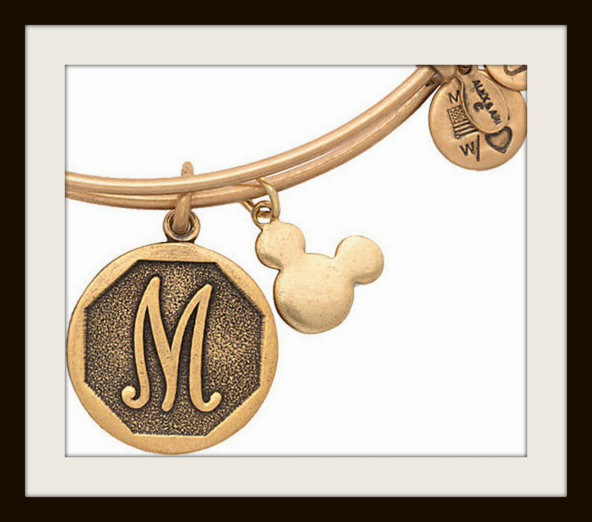 A filigree design is etched into the Mickey Mouse Finigree Bangle in Gold. 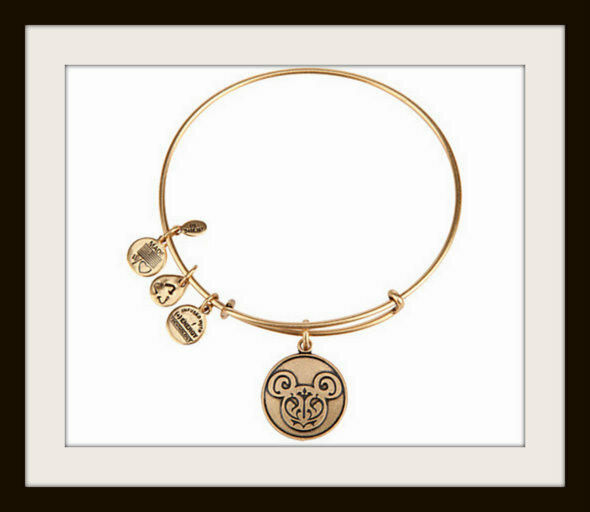 The icon charm brings positive energy to this Rafaelian Gold finish Bangle. Designed to ”enlighten the mind, and empower the spirit,” this bracelet features a sliding mechanism for a perfect fit. Click here for the link on the Disneystore.com. The price? Just $39.95 before tax and shipping. 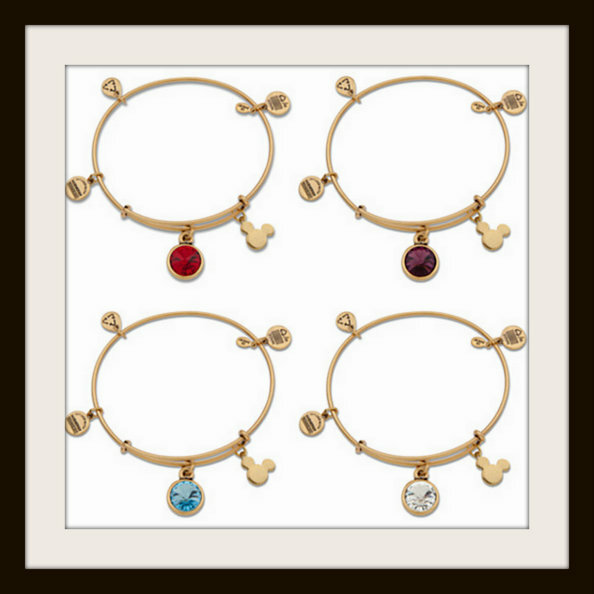 It’s time to celebrate your birth month in sparkling style with a Mickey Mouse Birthstone Bangle in Gold. 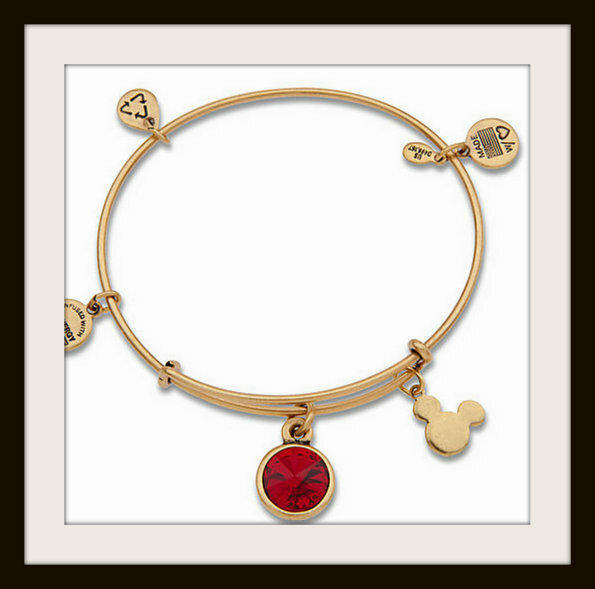 Designed to provide positive energy, this shiny bangle features a Mickey icon, birthstone, and sliding mechanism for a perfect fit. Click here for the link on the Disneystore.com. The price? Just $31.95 before tax and shipping. This Charm Bracelet has lots of Mickey character. 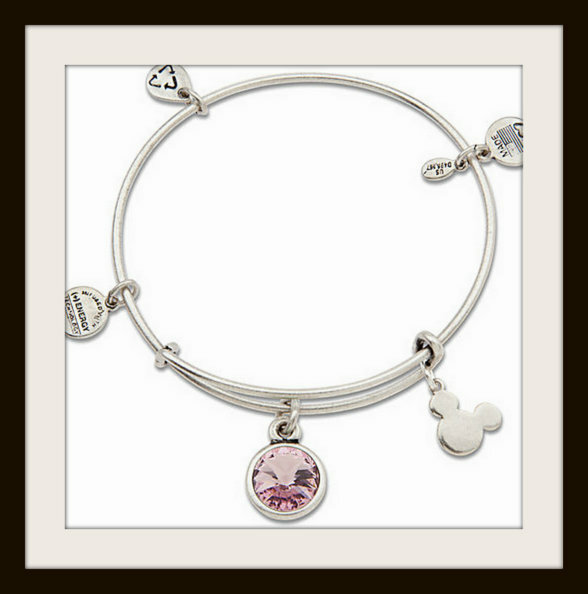 “Infused with the power of positive energy,” the Rafaelian Silver Mickey Mouse Bangle bracelet features a larger Mickey’s smiling face and four smaller charms. 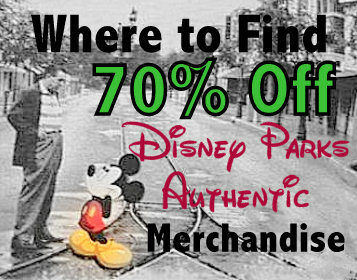 Click here for the link on the Disneystore.com. The price? Just $39.95 before tax and shipping. Enjoy a spot of positive energy courtesy of this Minnie Mouse Bangle. Designed to ”enlighten the mind, and empower the spirit,” this bracelet features a Rafaelian Silver finish and sliding mechanism for a perfect fit. Click here for the link on the Disneystore.com. The price? Just $39.95 before tax and shipping. A cloisonné charm with his iconic ear hat brings positive energy to this Shiny Silver finish Bangle. Designed to ”enlighten the mind, and empower the spirit,” it features a sliding mechanism for a perfect fit. Click here for the link on the Disneystore.com. The price? Just $39.95 before tax and shipping. These are more photos of the jewelry listed above, where you can see more details of their outstanding craftsmanship. I was pleasantly surprised when I realized that the Disney Store (links to each piece are above) prices were far lower than eBay prices are right now. There seem to be no real bargains on purchasing from eBay, with prices for the same pieces ranging from $59.95 to $65.95 before shipping. 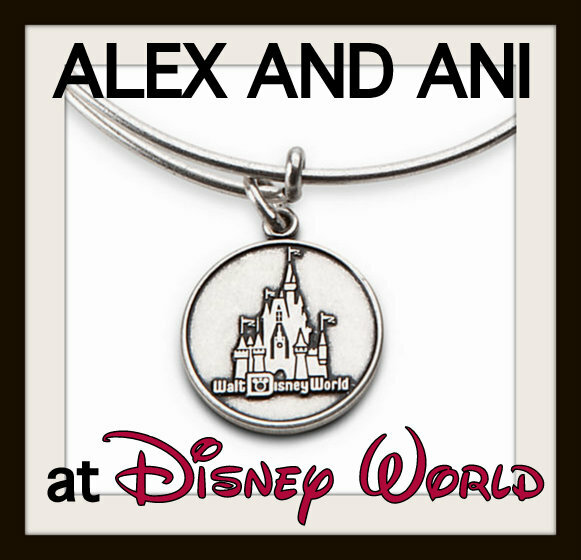 You can also visit Alex and Ani.com to see more of their jewelry designs. It’s hard to resist the idea of products created with positive energy right here in the United States. We could all use a little more positiveness in our lives. 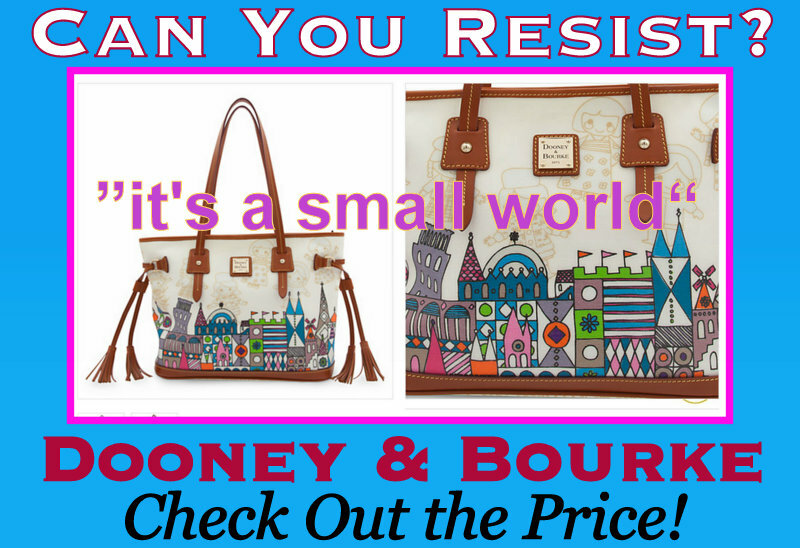 And of course, we could all use a little more Disney as well! 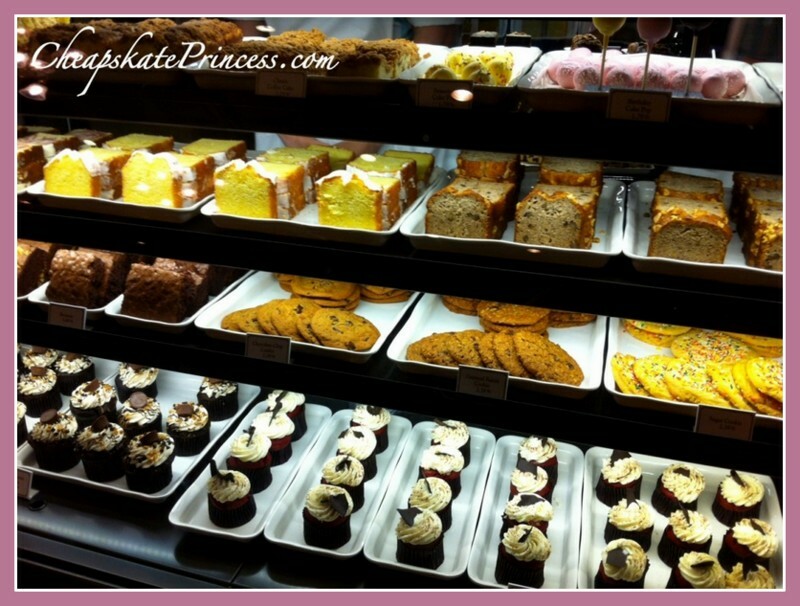 The Main Street Bakery at the Magic Kingdom caused quite a stir last year when they essentially became a Starbucks after months of remodeling. When the doors re-opened in June of 2013, the sign above the door still read “Main Street Bakery,” but the great majority of the food and drink items sold there were revealed to be Starbucks products. “The Cinnamon Roll,” a long time bakery favorite with many fans, was moved to Gaston’s Tavern. Not that there was a tremendous amount of seating to begin with, but what seats there had been were removed to make room for two sides of counter space for ordering, sales and product delivery. Disney fan’s reactions? Long-time bakery lovers complained on the Internet, some actually boycotting the new bakery, meanwhile Starbucks fans rejoiced there was finally some “good” coffee to be found in the Magic Kingdom. 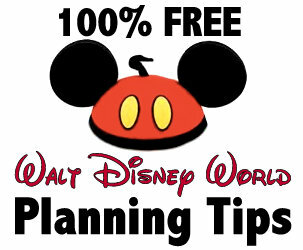 If they are not currently open by now, Starbucks locations will be found in all four theme parks and Downtown Disney. So even if you can’t have a seat, or purchase bakery items you loved before the remodel, have you ever wondered about the prices? 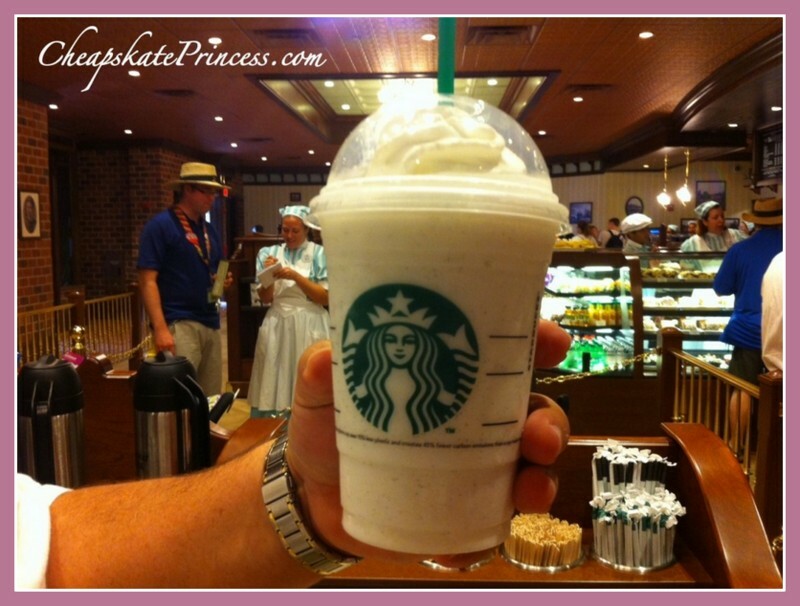 Can you afford Starbucks items when they are served on Disney property? Let’s take a look at current menu items and pricing, and you Starbucks regulars can decide if these prices are higher or lower than what you currently pay. 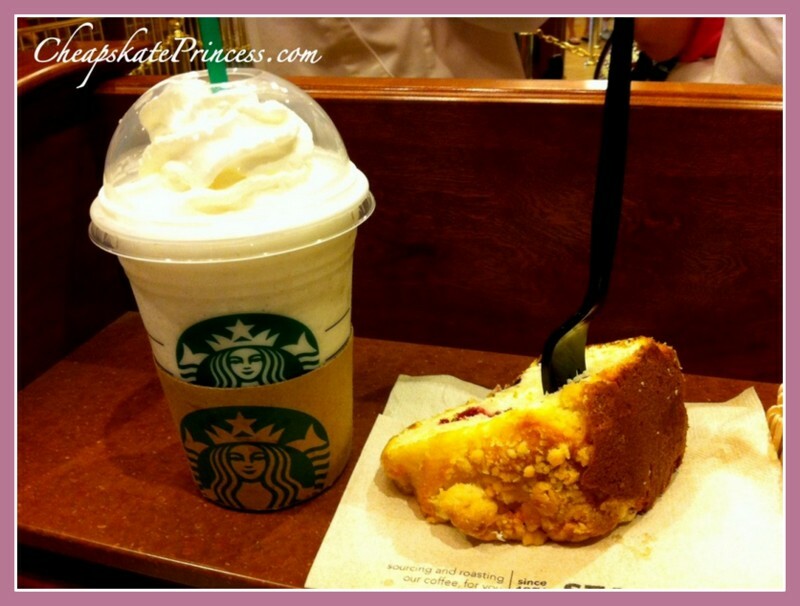 These items count as a Disney Dining Plan snack, and the sizes are Tall 12oz./Grande 16 oz./Venti 24 oz. These items count as a Disney Dining Plan snack item, and the sizes are Tall 12oz./Grande 16 oz./Venti 24 oz. These items count as a Disney Dining Plan snack item, and they are blended with a whole banana and whey protein. These items count as a Disney Dining Plan snack item, and they come in sizes Tall 12oz./Grande 16 oz./Venti 24 oz. These items count as a Disney Dining Plan snack item, and the come in sizes Tall 12oz./Grande 16 oz./Venti 24 oz./Trenta 31 oz. These items count as a Disney Dining Plan snack item, and they come in sizes Tall 12oz./Grande 16 oz./Venti 24 oz./Trenta 31 oz. 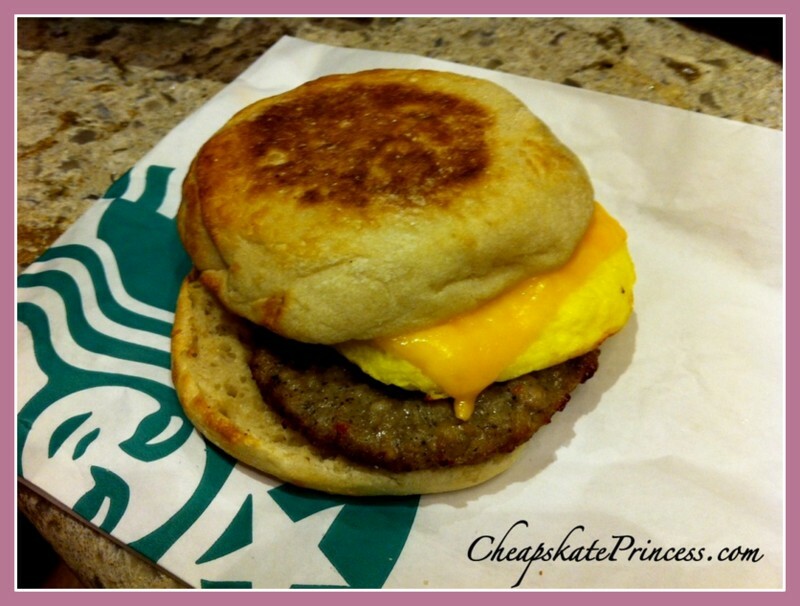 The Quick Service Breakfast Meal counts toward the Disney Dining Plan. 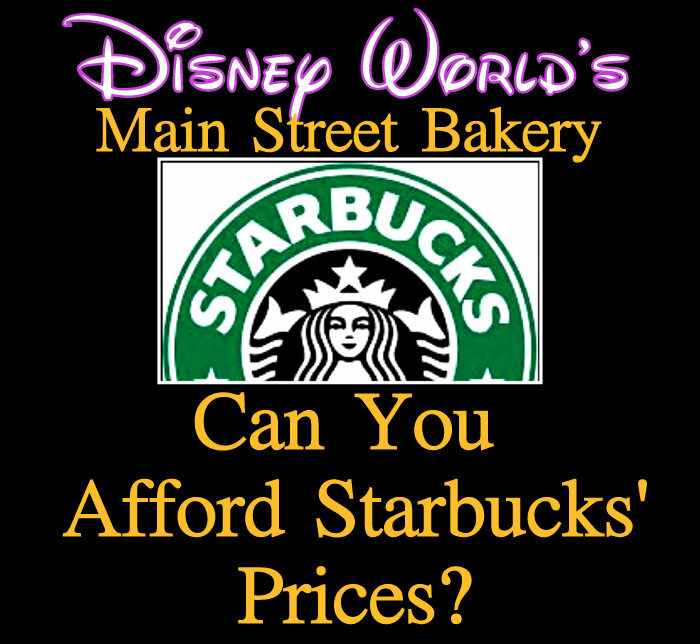 So there you go, prices for the new Main Street Starbucks Bakery. Breakfast items for under $5.00 and iced coffees for under $3.00. If you look closely, these prices are actually lower than many of the goodies and treats in many locations throughout Disney World. And remember that prices and menu items can change at any time without notice. You may have to stand to eat at the counters along the wall or outside on the sidewalk, but you certainly won’t wreck your vacation budget if you pay a visit. Ever wondered what your Starbucks is taking from your vacation fund? We did the math for you. Some of you may be shocked. Are these prices what you pay on a day to day basis when you visit Starbucks? And because most people have daily access to Starbucks products, does this make you look more or less forward to a bakery visit? 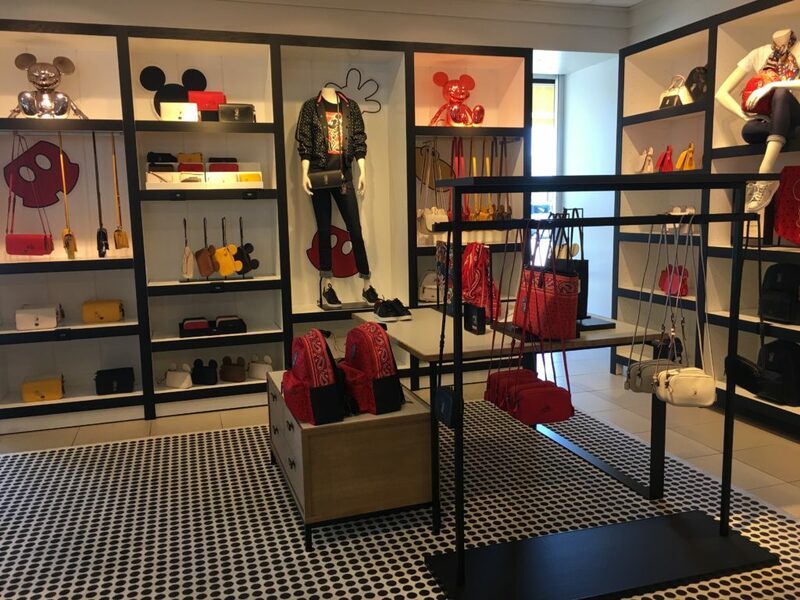 As if saving money for your next vacation wasn’t chore enough, the Disney Company keeps teaming up with these clothing and handbag designers to bring us merchandise that is almost too irresistible. 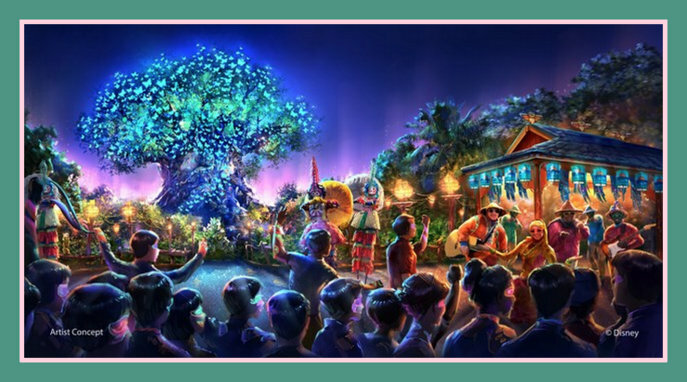 While I personally have not spotted this item in any park or resort gift shops (let me know if you have!) it’s all too easy to find online. 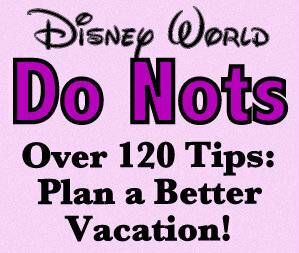 This is a Disney World vacation planing web site. 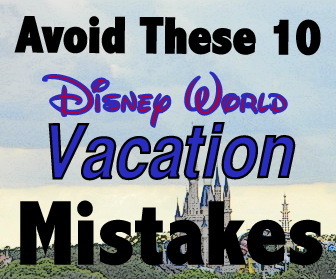 I have never written here about any subject that didn’t pertain to Disney. 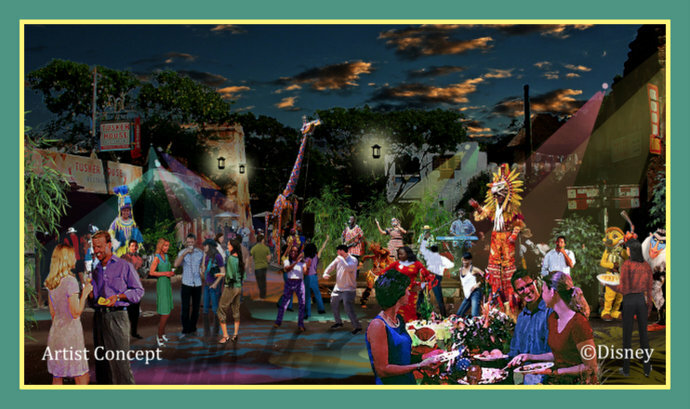 When you write about planning vacations to “The Happiest Place on Earth,” most everything you cover is indeed happy. Happy resorts, happy kids, happy family, and happy times. But this is not Earth changing stuff. There are moments when I have asked myself if planning the use of disposable income is what I really should do with my free time. My friend George Throop from Enjoythewalk.org dedicated almost five years of his life to walking across America to spread the word about how to avoid cancer, like the cancer that took his own mother when she was just 24. I couldn’t bring myself to even tell him I wrote articles about Disney. It seemed to pale so hugely in comparison, with me pricing Disney souvenirs and George aiming to stop the spread of a deadly disease. 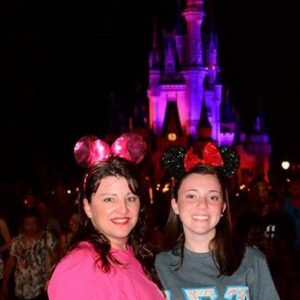 My good friend Mike Ellis from My Dreams of Disney writes an article each week posting prayer requests, and none of his readers are asking to win the lottery to fund their next vacation. The pain and suffering of many people is so great, it can sometimes cause you to put your vacation dreams and plans in perspective. I’ve asked myself what is important. All my high school friends were in band, and I trotted off to college on a music scholarship. I met my husband, the love of my life, in college band, and my three children are in beginner and high school band. With my band director husband, I teach hundreds of students each year during band camp week, which this year is challenging 250 teens. We also work with a fantastic band staff and amazing parents. I have loved band since I was 13, and I still love working with band kids at 43. Band is a family that you make for yourself. My husband received a text last weekend saying a former band student of ours was given just several days to live. Her name is Meleney Harris. We knew Meleney had been diagnosed with cancer, and we knew she had been up and down in terms of the medical treatment effectiveness throughout the last year. To hear that her life expectancy was just several more days was both startling and heart breaking. 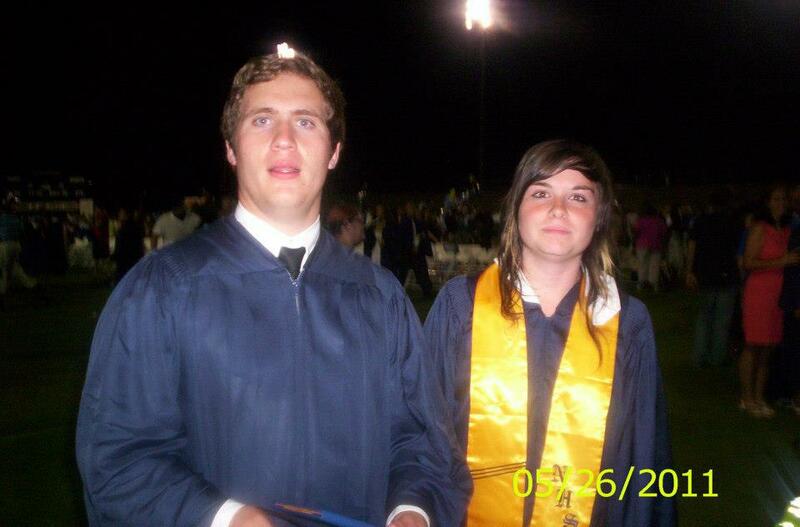 Meleney was one of those students that you just remembered instantly, even if she graduated several years ago. Meleney is one of our band family. I remember Meleney the most from band camp, her unusual hair, her quirky t-shirts and crazy shoes, and her huge smile. She was not the type of kid to complain, and she always ran back to her spot. If someone was new, she was sure to show them the way. She was easy-going, helpful and cheerful. 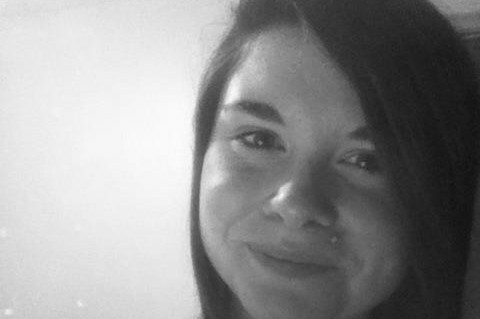 She was the kind of kid you would be proud to call your own, someone you could count on, a friend you would want to have. She was a leader you followed, and to catch her, you better run back to your spot. My very favorite Meleney memory took place in 2009 on a band trip to Chicago. We went to see Blue Man Group, and just a sophomore, Meleney was chosen from the whole theater to go up on stage. If they had chosen me, I would have surely refused, too shy, too embarrass-able. Not Mel. In front of hundreds of mostly strangers, dressed in some sort of plastic protective covering, Meleney shared an intimate on-stage meal with the three blue guys, where they spewed crunchy cereal and sprayed her with some sort of cheese substance. She totally played along, and the crowd loved her. 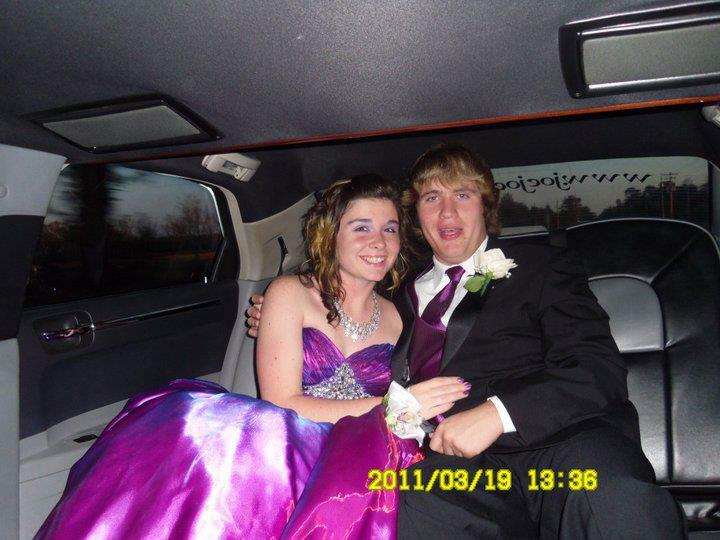 She was the epitome of the word “band kid.” She was a Shining Star in the Foley High School Band. 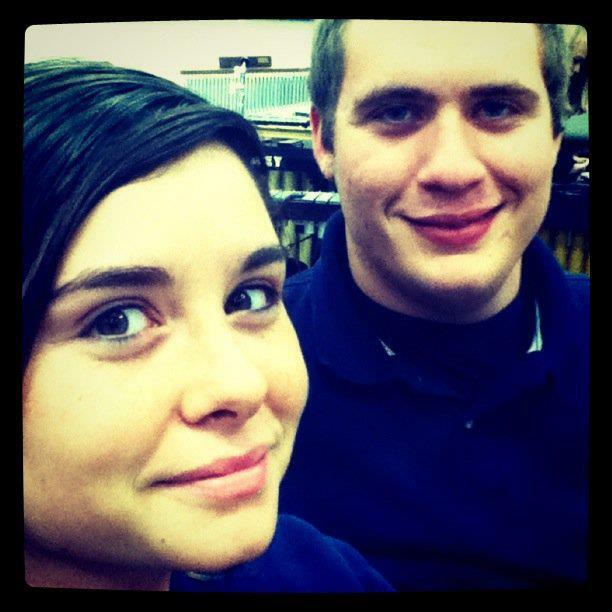 In this photo, she is in the band room with her future fiancé, Daniel McWatters. I have asked myself what is important. I thought it was important to share Meleney’s story today. Meleney Harris is a graduate of Foley High School, where she was a straight A student. She was planning to attend college to be an ultrasound technician. All this came to a complete stop when she was diagnosed with Ewing’s sarcoma. Ewing’s sarcoma is a primary bone cancer that affects mainly children and adolescents. It’s one of a group of cancers known collectively as the Ewing sarcoma family of tumors — ESFT or sometimes just EFT. It’s the second most common bone cancer in children, but it’s also relatively uncommon. It accounts for only 1% of all childhood cancers. Although it can occur at any age, it very rarely occurs in adults over the age of 30. As there are no known risk factors that can be changed and no screening test to effectively identify someone prone to develop this cancer, there is no way to prevent it. There are approximately 200 new cases of Ewing’s sarcoma diagnosed in the United States annually, and somehow, Shining Star Melenie Harris was one of those 200. Meleney has spent seven months going through surgeries and chemotherapy. Her tumor was resistant to chemo, and now the tumor is pushing on her lungs, collapsing them, and putting pressure on her heart. There is nothing that can be done. Meleney Harris, Shining Star, is dying of cancer, quite probably within the week based on her doctor’s prognosis. That makes you ask yourself what is important. 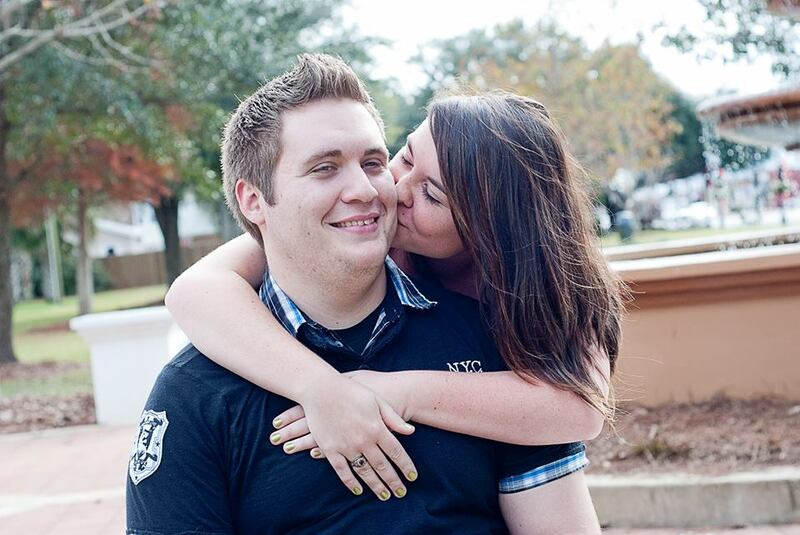 Meleney started dating her fiancé, Daniel McWatters, when she was in my husband’s band. 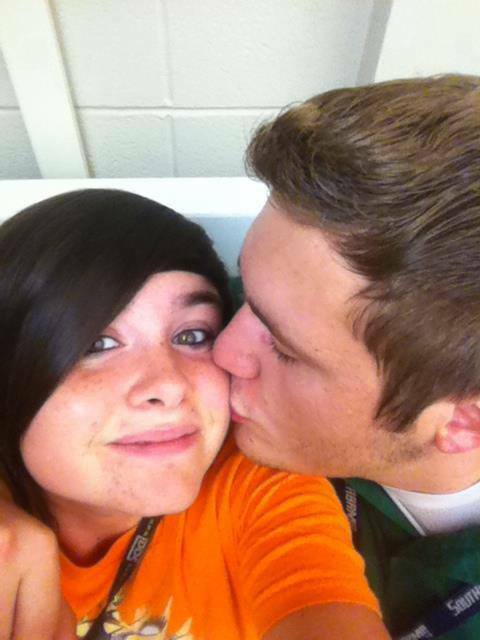 We watched them flirt, hang out, date, fall in love, and graduate high school together. 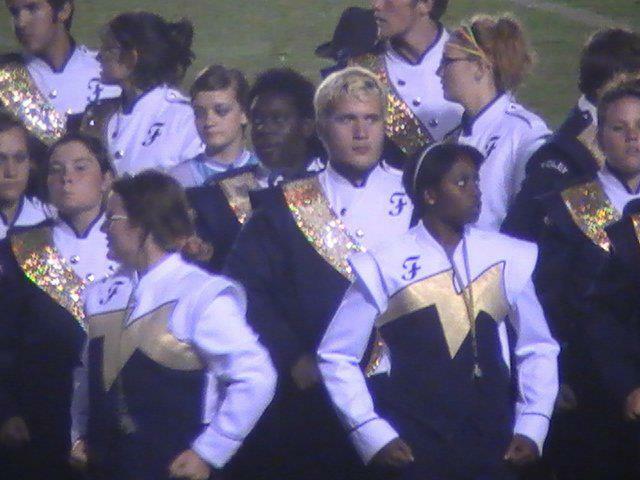 Even at marching contest, with other senior band members, they stood together. 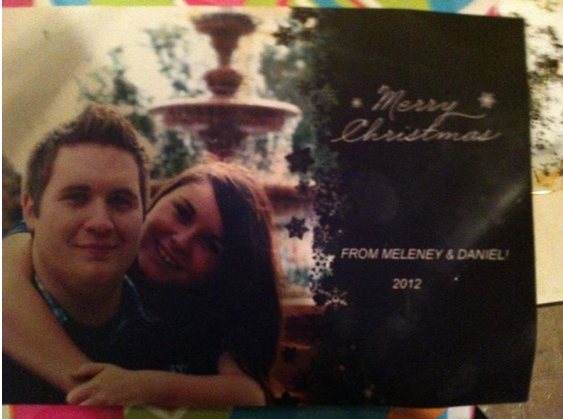 When Meleney got sick, friends and family of the couple said Daniel was always there for her. How tragic to see the woman you have loved since high school slip from your life while living with daily pain. How crushing to see a family member suffer and then have to worry about how you will pay for the funeral. How amazingly unfair to know you are dying and to worry about the people you leave behind. 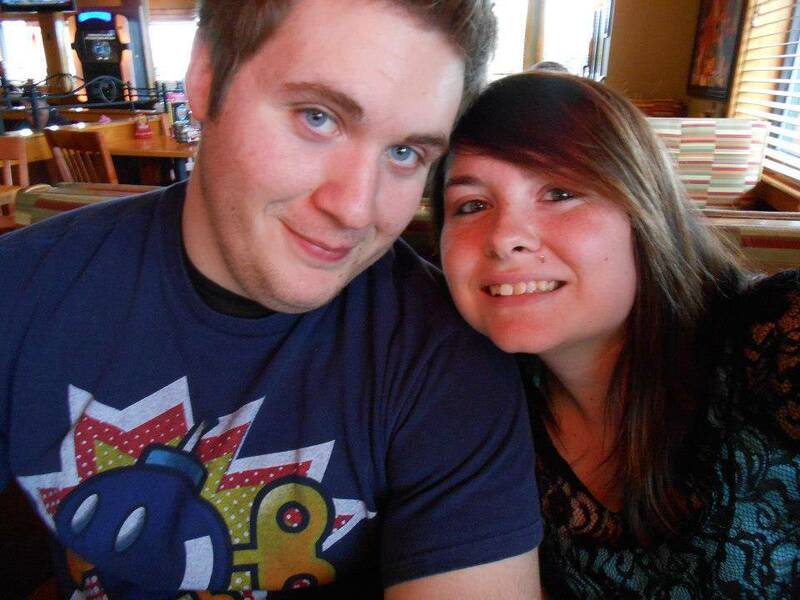 Suzi Hall, Daniel’s mother, started a GoFundMe campaign to help defray the costs of Meleney’s funeral. Can you imagine planning your own funeral? Melenny has done just that. I think most of us, at one high school time or another, thought we would go on to marry our high school sweetie, but surely none of us ever envisioned planning a funeral together and then worrying about how to pay for it. 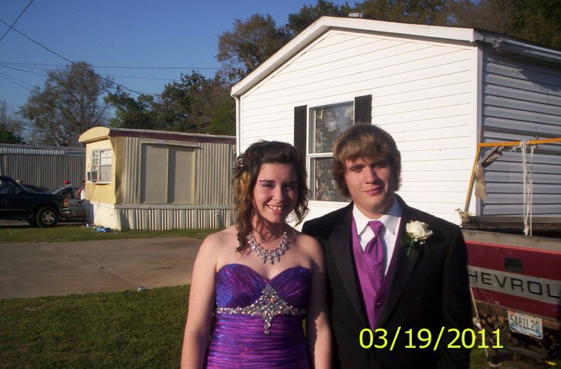 In this photo, Meleney and Daniel are headed to prom, not knowing this is the dress she will ask to be buried in barely two years later. I can’t imagine seeing my child suffer with cancer. I can’t imagine having the strength to plan my own funeral. I can’t imagine knowing I was losing someone I loved with all my heart, and then had to worry with how I would pay for their funeral. I ask myself what is important. Today my family made a donation to the funeral fund for our former high school student who was a Foley Band Shining Star as she loses her battle with cancer. Most of you will not know her, which is unfortunate. She is indeed a Shining Star, both on and off the marching field, in the classroom, around the community, and in our Foley Band family. If you had met her, she would have shaken your hand, said something funny, and her smile would have set you at ease. That’s just how she is. Today, sharing Meleney Harris’ fight with cancer seemed more important than talking about Disney World. Use this link to go to GoFundMe.com for Meleney Harris. This year about 564,800 Americans are expected to die of cancer—more than 1,500 people a day. Cancer is the second leading cause of death in the U.S., exceeded only by heart disease. One of every four deaths in the U.S. is from cancer. Since 1990, there have been approximately 5 million cancer deaths. A lot of Shining Stars have been lost, and today it seemed important to focus on just one. I have wiped away a lot of tears in locating these photos and reading the words of encouragement from her high school friends and family posted on a Facebook group called Meleney’s Angels. If Meleney’s story has touched your heart, it was important to me to ask that you consider making a donation toward her funeral expenses. It’s about time her family got a break. This article was written on July 3o, and Meleney passed away on August 13th after a long battle with her illness. I wanted to thank everyone who has donated money for her funeral. 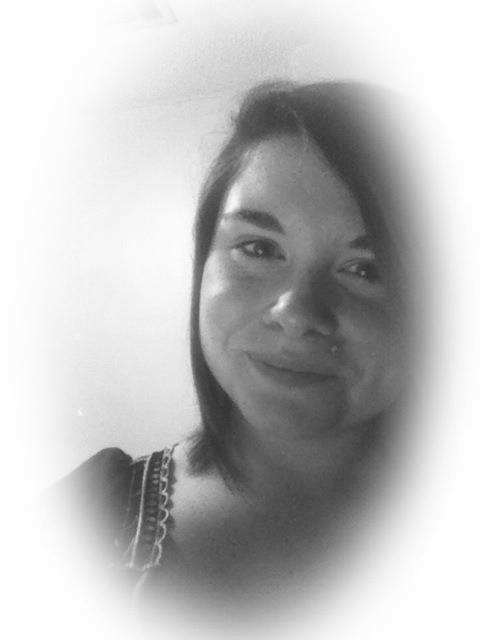 As of August 13th, they are still raising funds to bury a beautiful shining star. Peace, love, and light to Melanie Harris, her fiancé Daniel McWatters, their families and close friends, and all the kids in the Foley Band who loved her. 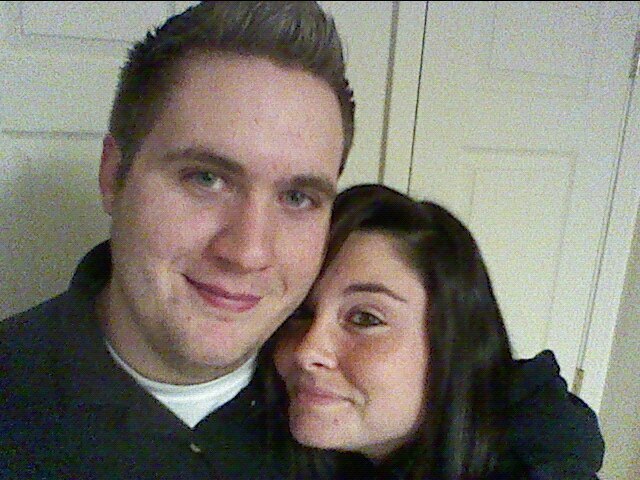 Go hug someone, and tell them how much they mean to you, because life is short and certainly not always fair. Thanks for reading and for thinking about Meleney. Thank you again for your donations, and keep them in your prayers.